The Adventures of Sam and Caroline: Machu Picchu - totally worth the trek! This past weekend, Caroline and I traveled from Santiago in Chile to visit Machu Picchu, a famous lost city of the Incas in the mountains of Peru. Machu Picchu is a truly spectacular sight, and I think part of what makes it so special is that it is very remote and hard to reach. Of course, the downside is that it is very remote and hard to reach! There will also be more pictures shared by Caroline. 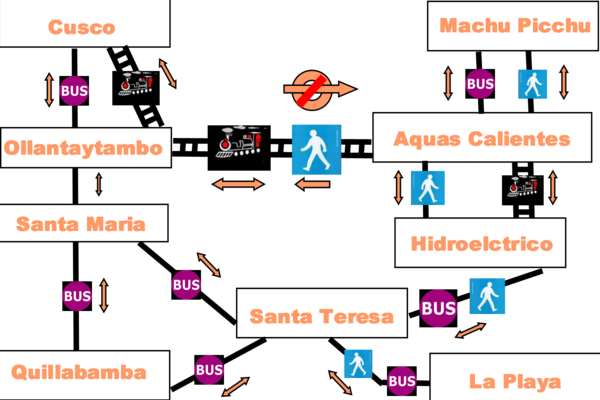 OK, so our plan was to reach Aguas Calientes by Friday night, stay overnight in a hostel and then wake up super early on Saturday to hike to the top of Machu Picchu. Our flight landed in Cuzco around 1pm, and we ran to the Peru Rail ticket booth to book seats on the last evening train from Ollantaytambo to Aguas Calientes, around 9pm. Unfortunately, it was sold out and the only seats available were on a 3:30 train! Could we make it on time? We had to try! After negotiating with a cab driver, we decided that even after we got him down to 140 soles it was too much to take a cab, so we got into a collectivo (a shared van shuttle) going to Ollantaytambo. We didn't realize, but this was a much slower option because we had to stop and pick up more people along the way, including some folks who were really late. We arrived in Ollantaytambo just a little after 3:30pm, so at this point there are no trains to Aguas Calientes on Friday. "That's fine," we figured. "We'll take the first train in the morning and hike up a little later than expected." We bought seats on the 5am train, and also bought return tickets for the 6:45pm (this turned out to be a crucial and awesome move). We found a cheap hostel to stay in that night, got some dinner and went to bed very early. The next morning we got on the train, and everything was going well. They served us some tea on the train, which was nice. However, as we got closer to the destination, Caroline started feeling motion sick, and we also realized that the tea might have been made with Peruvian tap water (which isn't so good). We arrived in Aguas Calientes at around 6:30am, and at this point all Caroline could do is get off the train and huddle in a ball on the side of the road, moaning. After puking into a street drain, she was still not feeling so good, but she had a great idea. We had originally booked a hostel in Ag. Cal. for Friday night - maybe we could use the room this morning even though we didn't arrive on time to use it the previous night! We found the hostel and the people there were so nice! We explained the situation (in Spanish) and they were happy to give us a room. Caroline napped for three hours and I sat and talked to other travelers. It actually turned out to be a good thing we started later (around 11am) rather than at 6am as we had originally planned, because it rained all morning! When Caroline woke up she was feeling much better, and now the only thing that stood between us and Machu Picchu was a 2 hour hike up stairs covering 400m of elevation. There is an option to pay for a bus, but with Caroline already feeling motion sick, we thought a bumpy bus ride was a bad idea. The hike was tough, and a lot of stairs, but we made it to the top and it was wonderful! At first it was cloudy and misty, so the whole thing looked magical. As the day went on, the clouds lifted and we had beautiful sunshine. We felt so lucky, especially because November is the start of the rainy season and so we knew that we couldn't count on good weather. Also, because it is the rainy season, the tourist crowds are smaller than during peak season, so we even had some moments to ourselves among the ruins when we could enjoy them in peace and quiet. After a few hours exploring, we made the hike back down. We were SO GLAD that we had a late return train, so that we weren't stressed or rushed even with the late start. We reversed all the steps from before to make it back to Cuzco, stayed overnight in a hostel and then flew home first thing in the morning. We were back in our apartment in Santiago by about 6pm on Sunday. So, can you see Machu Picchu in a weekend? Yes. Was it awesome? Totally. Would I recommend it? Well, I'd say you're better off with a longer trip so it isn't so rushed, but if you have the choice to do it in a weekend or not do it at all, definitely go. Great pictures and an awesome trip. Glad you left off the picture of Caroline puking! Haha, the part about Caroline puking in a drain is really funny even though I feel very bad that it happened.